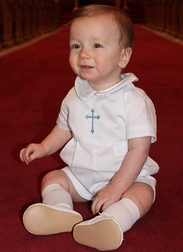 Here we have our baby boy, infant and toddler boy monogrammed white romper bubble, Christening utfit, Baptism outfit, Easter outfit also perfect for new baby and shower gifts. 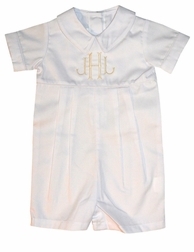 This sweet little white shortall/romper is made of a pique like fabric and buttons in the back. The neck has a pointed Peter Pan collar and sleeves that are piped in the same white fabric. The front of the romper has precious little pleats for a more tailored look. 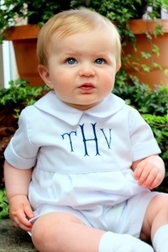 The bodice is perfect for a monogram OR a beautiful cross. Finish the outit with white knee socks and cute oxfords!.